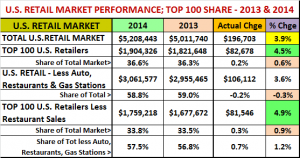 U.S. Top 100 Retailers – Who is up? Who is down? Who sells “Pet”? The U.S. Retail market is impressive to say the least. In 2014, the total retail sales were over $5 Trillion. This total comes from retailers of every size and type – from Super Centers to individually owned pet shops. Yes, it also includes online retailers. You don’t have to have a “brick ‘n mortar” store to be a retailer in today’s world. In this post we will try to narrow the focus to the top 100 Retailers in the U.S. Market. These 100 companies account for 1/3 of the total retail market! 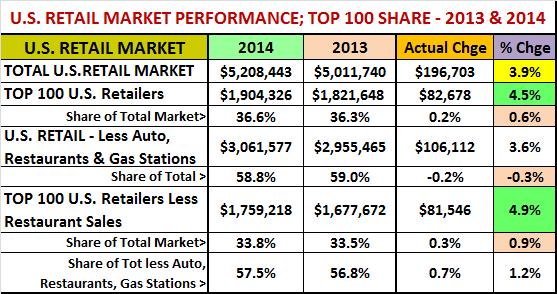 How did they perform in 2014 vs 2013…and of course, which ones sell Pet Products? I will warn you that it is crammed with data but we’ll try to break it into smaller pieces with regular observations. All of the base data was done by Kantar Research and published by the National Retail Federation (NRF). An important reminder: Remember you can click on the data charts to get a better view. On some of the more detailed charts you can even expand this enhanced image by clicking on the button that appears in the upper right corner. This makes the details very clear and easy to read. 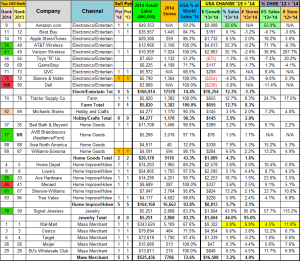 I have also included a download link to an excel file at the end of the post so you can sort and print all of the individual company data on the Top 100. The Top 100 grew $83B and the growth rate of 4.5% exceeded the overall market. The Top 100 accounts for 36% of the total market. Let’s pare it down a bit. If you take out Auto, Restaurant and Gas Station sales, the “target” retail market for our industry is $3 Trillion. – about 59% of the total market. 57% of the target market. The Top 100 is obviously critically important, and right now it’s outperforming the overall market. We need to remember that this “Top 100 club” is in fact a contest. Every year companies drop out and new ones replace them. This can be the result of acquisitions or simply slumping sales. You’ll see the new additions during the course of the report. Dropping out of the Top 100 in 2014 were: Harris Teeter Groc. and Office Max – (both acquired); Ingles Markets, Roundy’s Suprmkt, Brinker Intrnlt (Chilli’s,Maggianos) and Bloomin’ Brands (Outback, Carrabas) – all with slowed sales. Now let’s start “drilling down” on the Top 100. Here’s a summary of Regular and Online Retailers versus Restaurants. Biggest note may be that the Retailers have 60% of the stores but 92% of the business. The growth in Retailers is driving the top 100. 6.9% in stores – over 4 times the rate of restaurants. Cautionary note: The % increase in sales is not matching the % increase of sales. Now that we have an overview of the Top 100, we’ll take a look at the “targeted” retailer segment. There are 85 total companies. How many are buying and selling Pet Products? Here’s where we can specifically see how Pets have become an integral part of the American Household and how fierce is the competition for the Pet Parents’ $. 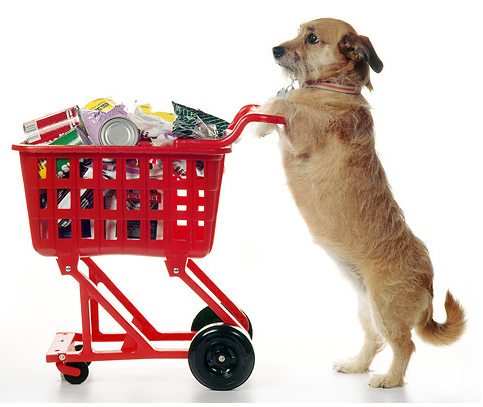 Of 85 possible companies, 69 are selling some mixture of Pet Products in stores and/or online. These totals are only for the Top 100 and include only 1 Pet Chain and 1 Farm Store Chain as they were the only companies to make the list. Pet Products are sold in thousands of other outlets. The data from the 2012 U.S. Economic Census detailed over 150,000 retail stores selling Pet Items. With only moderate growth in store numbers (5%), the total would exceed 165,000 in 2014. In the next segment we will look at the detailed list of the top 100. 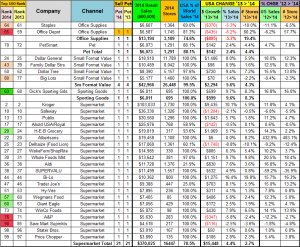 We’ll sort it by retail channel with subtotals in key columns. We’ll then break it into smaller sections for comments. Remember, at the end of the post there will be a download link for an Excel file with the data. This will allow you to sort it as you choose…by rank, alpha, pet/nonpet…it’s your call. Remember online sales are included in the sales of all companies. Drug still showing steady, slow growth overall. It is being driven by the Big 3. The Department store segment overall is declining. This particular group is showing some growth, even with a reduced store count. 3 companies started carrying pet (limited skus) – all online only. Penney’s moved some items to retail. Sears (includes Kmart) is dropping in sales and especially store count. Americans are still driven by convenience so these convenience stores are doing well. The drop in Military Commissary sales is slight but somewhat surprising. Considering how much our pets accompany us in the car, it is somewhat surprising that their offering of Pet items is sparse. Three of the Apparel Value retailers are showing the largest growth and they all have Pet Products merchandised at retail. Headline: Amazon sales are only up 55.9% in 2 years! The Phone People – ATT, Verizon and Apple are growing faster than sending a text. Signet Jewelry’s spectacular growth comes from acquiring Zales. Last year neither were on the list. Now, together they are. Some of the other huge numbers are from similar acquisition situations. Mass Merchants growth is subpar. Wal-Mart is the “big dog”, but in 2yrs they have increased store count 11.8%..sales 4.5%. Target sales are up slightly. Big Gainers are the Clubs – Since 2012 Costco is up 12.2%, BJ’s is up 11.7%. Home Improvement/Hardware is showing growth from each of the “players”. Home Goods sales growth is slow but steady. 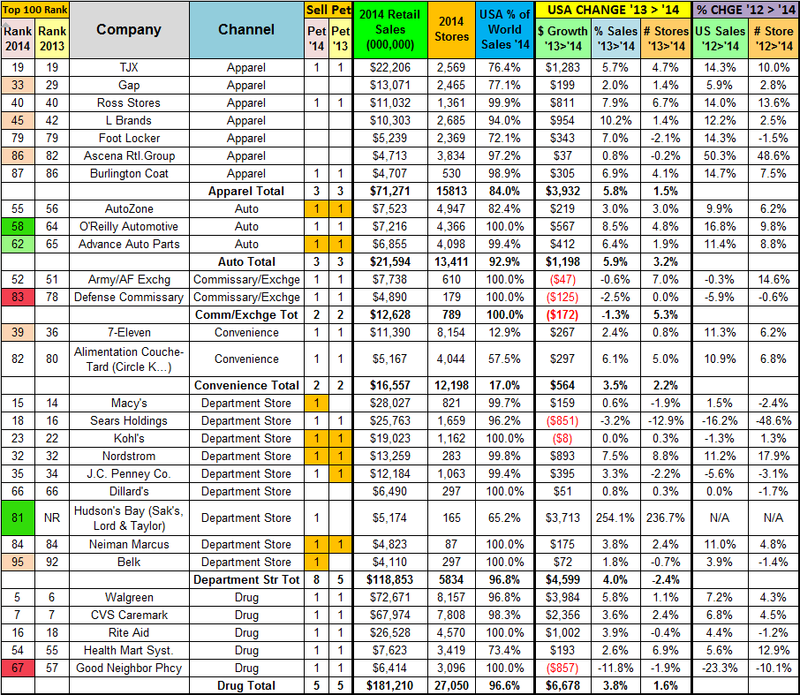 Supermarkets: Overall these stores are doing reasonably well. 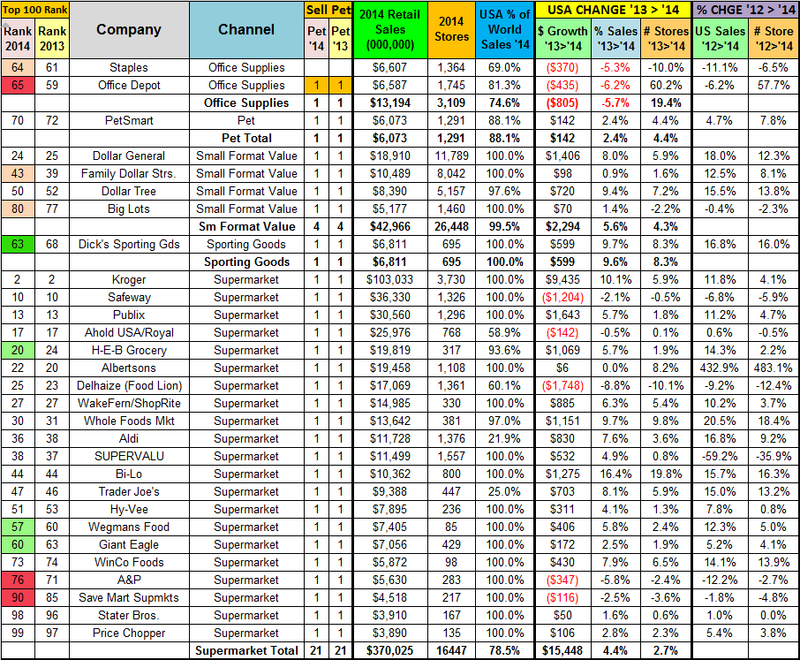 Some high enders like Whole Foods and Trader Joes are performing well. Some of Kroger’s growth comes from the acquisition of Harris Teeter. 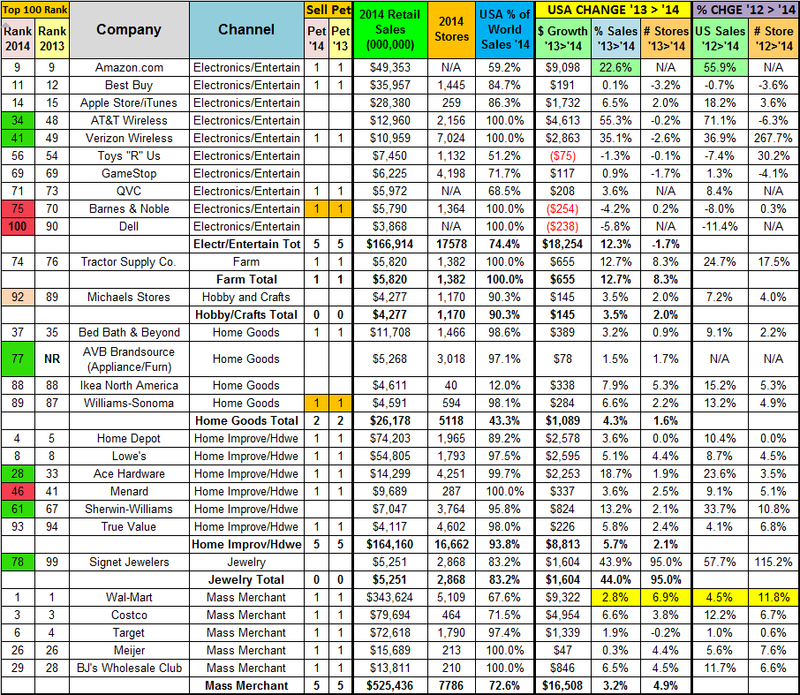 Bi-Lo, HEB, Wegman’s and Winco are all performing above the average. Small Format Value Stores: This segment does more business than Traditional Department Stores. Family Dollar Stores is the only one underperforming and they were just acquired by Dollar Tree. Dollar Tree is performing best at +9.4%. Now they will be operating with 13,000 stores. Big Lots is actually down 0.4% over 2 years. Although restaurants aren’t relevant in terms of Pet Products Sales, they are relevant in our daily lives. Almost all of the companies on this list are “fast food” or coffee. Chic-fil-A Starbucks and Chipotle are leading the pack. Of the big three, McDonalds, Burger King and Wendy’s, only Wendy’s is showing + numbers. There is a lot of detailed data here. 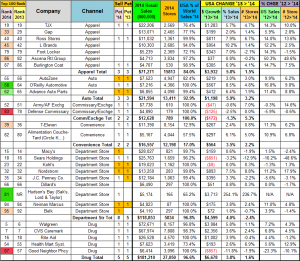 I encourage you to use the link below to download the Top 100 data file in Excel. It is in ranked order but you can sort it however you like. This group of stores accounts for 37% of the entire $5.2 Trillion U.S. Retail Market and is gaining ground. It’s probably worth a second look. Amazon Sales Up 55.9% in 2 years. Tractor Supply Up 24.7% in 2 years…as we Americans tend to our suburban “farms”. Take a look at the details to see what “hits home” with you…and let me know. I would love to hear your feedback.